I originally wrote this to submit to Taproot but my submission didn’t fit their needs so I decided to share it here as I didn’t have another place that I wanted to submit it to. Excuse some of the background information if you, you know, actually know me in real life or have been reading here for the last 10 years. Growing up, I was an ocean girl. I thought my destiny lay in the ocean, the vast and unexplored spanse of water that covers three-quarters of the Earth’s surface. This notion developed over the many years my family spent vacationing on the Texas coast, with a few trips to Florida interspersed for good measure. Any time I spent in a swimming pool involved me elaborately pretending in my head that I was an oceanographer diving to the depths of the seafloor, exploring reefs and subterranean features. Years later, marine biology degree in hand, I found myself working in the Florida Everglades instead of the ocean. The vast wetland that Marjory Stoneman Douglas called the River Of Grass became a stomping ground for my husband and me. I found myself loving the swamps, wetlands, and pine flatwood forests of south Florida. It was there that I became immersed with the woods and life on land. The interior of Florida is generally not a high priority for exploration with most. Tourists and snowbirds taking a day’s break from their sunbathing on the beach drive slowly down Tamiami Trail to scope out the migratory bird populations during the winter. Some may take an airboat ride through the sawgrass, but few dip their toes into the tannin rich waters that flood the lowlands during the summer months. Quickly I realized there was a subculture within the sub-tropical forests of south Florida. Die-hard swamp explorers and photographers, old-timers with a long history of living in the area telling stories about hunting panthers and the lawless days of the swamps, or orchid and rare plant enthusiasts bound and determined to find extirpated species. 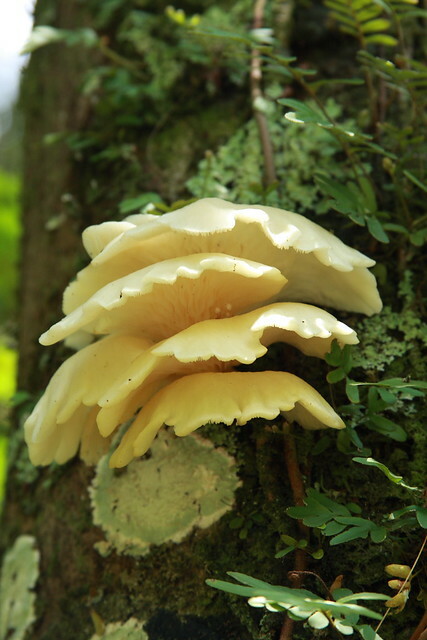 Our explorations began in places like Big Cypress National Preserve and Fakahatchee Strand Preserve State Park, both rich in rare and not-so-rare flora and fauna; and full of history. During the dry season, late fall through late spring, the black-amber waters that covered the surface of most of the Earth would dry up, evaporating or percolating away, revealing the land beneath. 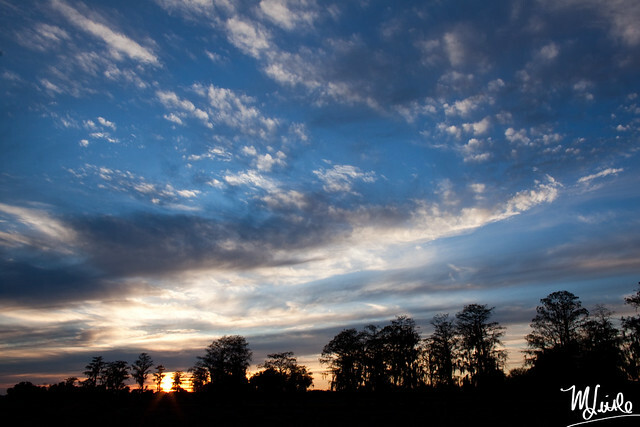 The dry season allowed for easier access through the swamps, hammocks and prairies. Instead of wading through waist deep water as we did during the summer, we traversed the dry sloughs and channels with relative ease instead. Big Cypress National Preserve was so named not because of the girth of the cypress trees within the preserve, but because of the sheer number of cypress that dotted the landscape. Dwarf pond cypresses populate the marl prairies, some of them as ancient as their taller cousins in the deeper cypress domes. Decorating these dwarf cypress and their bald cypress counterparts are various species of Tillandsia and other species of bromeliads, or what many people call air plants. Clumps of the red flowering T. fasciulata, commonly known as wild pine, adorn these trees along with other epiphytes, including orchids. Exploring the deeper sloughs is where we developed our interest in the unique, wooded ecosystems of south Florida. Fakahatchee Strand became famous with Susan Orlean’s The Orchid Thief and the story of John Laroche poaching rare orchids from the park. 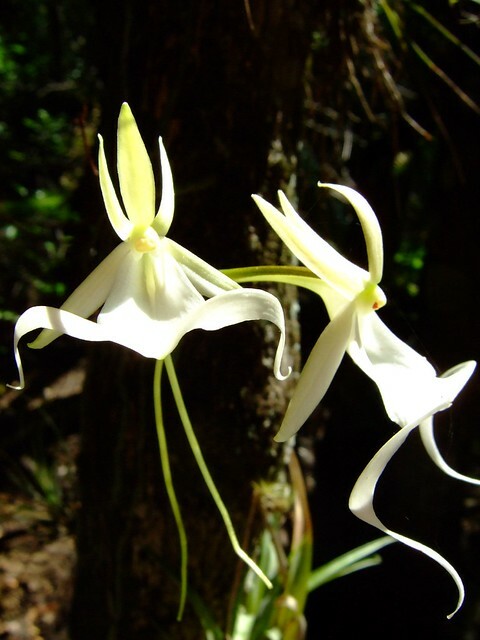 Soon the ghost orchid, the species popularized in the book, became synonymous with Fakahatchee Strand. 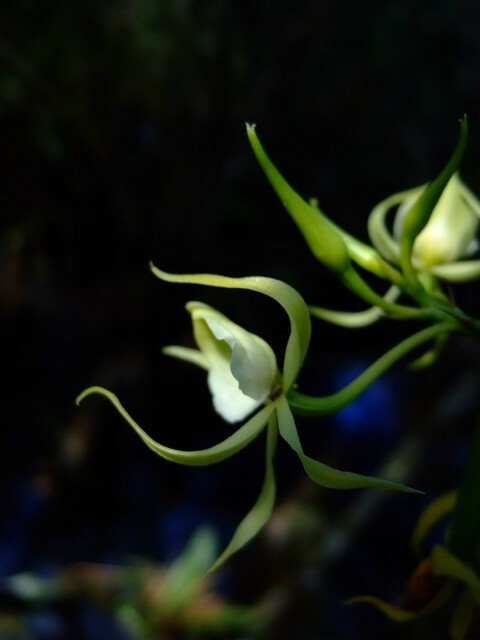 No wonder too, as this leafless orchid produces a greenish-white flower with ‘legs’ at the base that sometimes appear to form a heart. The flower spike emerges from the roots that cling to the tree, roots that upon closer inspection are patterned, green with short, thin stripes lining the roots. If a population of ghost orchids is known by someone it is always best to keep it to oneself because the amount of visitor traffic can quickly get out of hand. Despite trusting intentions, there are still unscrupulous folks willing to poach the orchids, despite being in cultivation where a plant can be bought online. Our first explorations into the swamp yielded no such luck in finding the elusive ghost orchid until many years later. 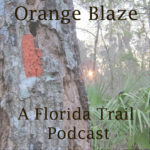 Instead we began on one of the numerous logging trams that scar Fakahatchee Strand, where we treaded beyond the maintained portions of a so-called trail before bushwhacking through overgrown Caesarweed and beggar’s tick. Once fed up with the slow going, we descended from the tram and into the swamps. During the wet season this idea is a bit scary and treacherous. Alligators live in almost every kind of waterbody in Florida as do water moccasins. However when the water retreats the alligators do too, leaving only snakes and mosquitoes to be wary of. Once the land is revealed, a nearly clear walking space provides an opportunity in which one could literally lose themselves if they didn’t know proper woods navigation skills. Debris on the floor of the swamp is almost timeless. Hollowed out cypress logs that have barely rotted in the last century since they were felled are common. Cypress knees are adorned with herbaceous plants that find any nook and cranny to seed themselves in. Trees with a surface area above the high water line in the summer become nurse logs, filling themselves with an abundance of bromeliads, orchids, grasses, sedges and ferns. 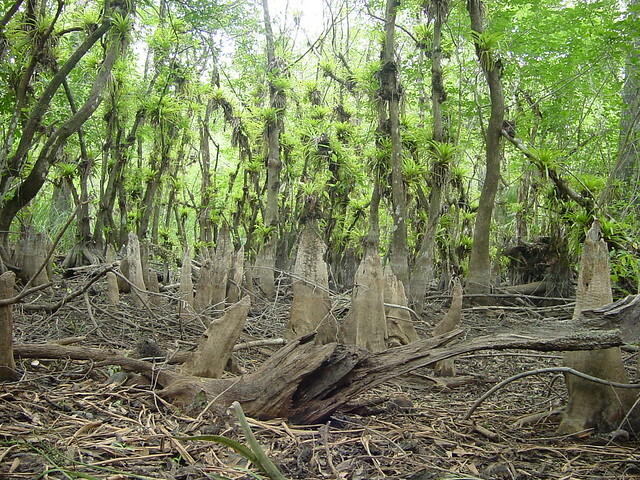 Even though maneuvering the swamp is easier during the dry season the forest is still dense in most areas, requiring those who separate from a group to consistently yell out so their presence is known. Beneath our feet the earth squishes easily. Centuries of organic matter have accumulated and not degraded, the result of hydric and anaerobic conditions preventing decomposition. With this continued wetness comes a musty odor that permeates the swamp. 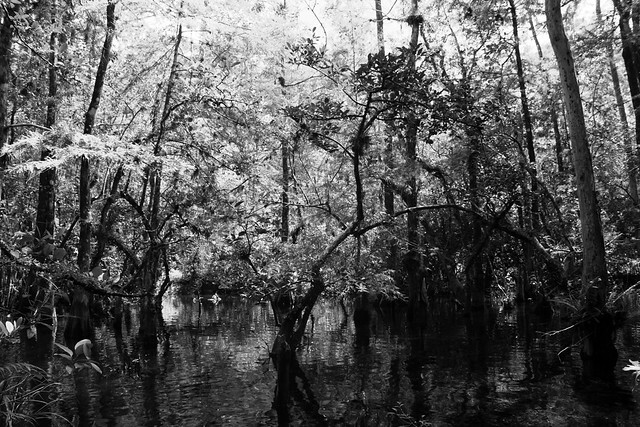 There are certain smells that feel like home to me, rotting sargassum (I know, I’m strange) and the must of the swamp. If I could pull a chair up and build myself a cabbage palm frond shelter (aka: a chickee) , I’d call myself home. That is a vanilla orchid vine I’m posing with. Ghost orchids aren’t the only exotic epiphyte growing in the swamps of south Florida. Vanilla orchids, yes that vanilla, vine up trees, looping themselves up whatever prop they can find, dangling back down when they can’t. To catch sight of the flowers you must get up in the wee hours of the morning during the summertime, as the later you arrive the less of a chance you have to see one open. Orchid varieties vary from leafless, epiphytic types such as the ghost orchid and leafless bentspur orchid to the brilliantly red, ground dwelling Fakahatchee beaked orchid. Finding an orchid is often a treasure hunt, knowing the right place to look, the correct habitat and understanding bloom times. 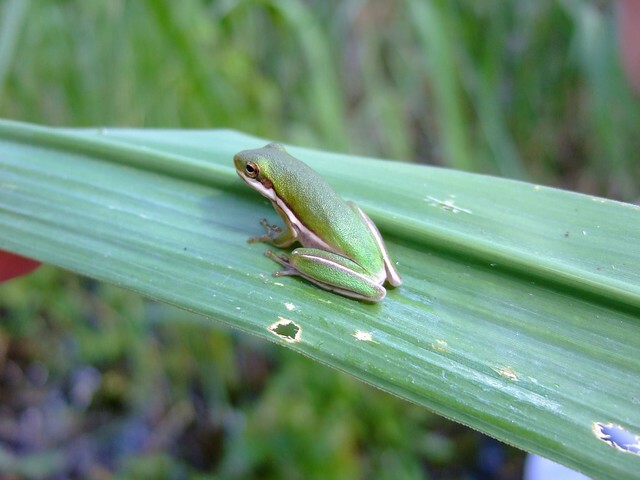 You may not find the species you were searching for the day of your exploration, but likely you won’t go home without seeing one of the many native Florida species. Wildlife in the swamp is harder to spot. 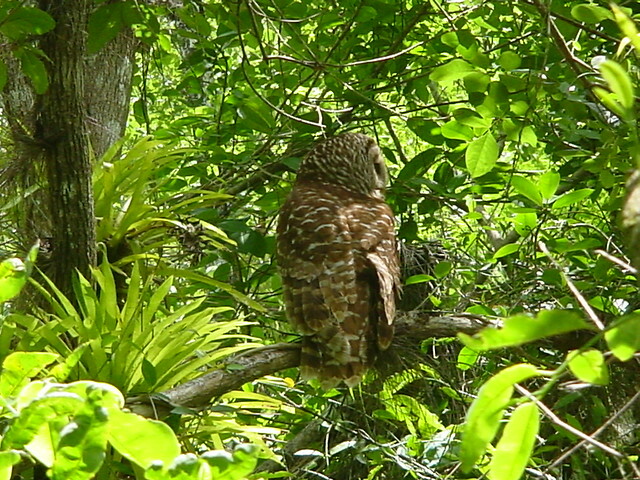 An owl randomly hooting will cause a flurry of eyes to fly up to the canopy in search of the source. Further overhead the whining call of the red-shouldered hawk always creates a smile inside me. Flying above the canopy they are often only heard and not seen. Echoes of hard thumping also result in eyes curiously searching overhead for the pileated woodpecker. 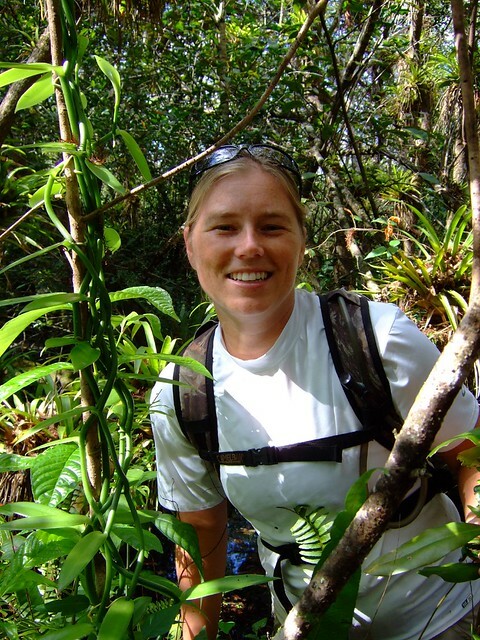 Not only do swamp explorers search for rare flora, extirpated fauna is on their minds too. The so-called Lord God Bird, the ivory billed woodpecker, used to haunt the swamps of Florida. It resembles the pileated in some manner, both being large woodpeckers, however not only are their colorations slightly different, their flying patterns and sounds are different. On occasion a bear or Florida panther may be spotted in the swamp. They too prefer to travel on paths of ease. 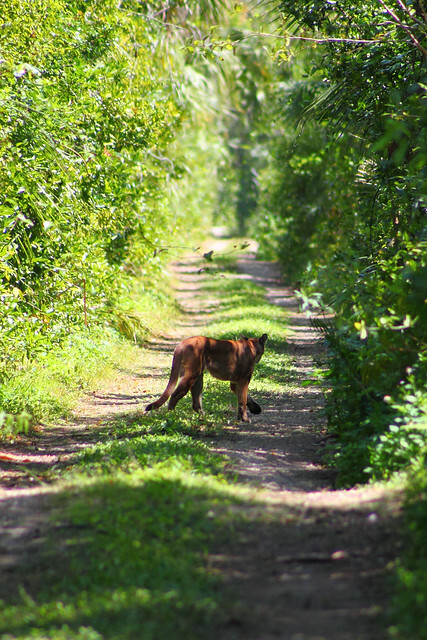 Our first panther sighting was of an adult female and two juveniles along Janes Scenic Drive in Fakahatchee Strand. Our next sighting was one of those instances that it seemed the stars aligned perfectly for the scenario to even play out. We’d just emerged from the swamp, pushed the brush back that lined the edge of one of the tram roads and looked to our right and left to see what we could see. To our right not ver far feet away was a panther. Talk about luck! Excitement was overtaken by shock and then slight panic, because after all we were pretty darn close! The panther causally looked over its shoulder at us, and then slowly meandered down the tram as its body gently swayed, tail flicking the air. For a minute we eased along with it, knowing it was probably not the smartest thing to do. It would stop when we would stop, turn its head again at us and then continue down as if it had all day to walk to wherever it intended to go. Panthers are known to be nocturnal and to be active around dusk and dawn, but this was the middle of the day. It was a strange encounter. My husband went on to later see three more panthers in Fakahatchee Strand, bringing his total number of sightings to seven, a rare feat unless you as a National Park Service biologist. Sometimes I was dismayed at the lack of interest to locals and visitors to the remote backcountry of south Florida, or even just to dabble inside the wild if only for an hour. The grand mountains and vistas of other regions in the United States may draw much of the masses but it is often the smaller picture, the subtle still-life within an ecosystem that holds the truth of its surroundings. The land and water, both fresh and salt, are connected in Florida. The river of grass and associated swamps, rivers and streams breathe life into the bays and estuaries. Our explorations into the swamp expanded into other regions of Florida, through pine flat woods, open prairies, and live oak hammocks draped in Spanish moss. Wild citrus trees often provided treats during our adventures, remnants of previous explorers and homesteaders. Sometimes the wildness intermingled with the tame; fence lines, cattle pastures and old swamp buggy trails. More often than not, we encountered few wherever we went. Despite my wish for others to see and enjoy the underappreciated interior ecosystems of Florida, I also found myself treasuring the solitude and quietness that I might not have if the open spaces became as popular as the Florida Keys during the lobster mini-season. And yet, I still want to show others that there is more in their backyard, Florida or otherwise, than they may know. I’ve learned that nature shows itself in many facets and often times it lays hiding under deadfall and overgrown shrubs before one can find it. Upon closer inspection, one can find that an ecosystem more alive than they initially believed. Sometimes you have to step off the trail and into the jungle to find what you truly love and appreciate. Loved reading this. Took me back to the swamps. You know, I haven’t been out much in the trails and wilds around me. I need to figure out a way to do it that would work with my health stuff (need to keep my feet sterile and dry, etc.) But I still “get it”, the mystery and the life that sort of bubbles up in between the spaces here in Florida. I mean, I do see and witness quite a bit of it just by living on the edge of the Everglades. I think it really made sense to me when I went with Tom to visit his family in Arizona. When I got back, I felt like my soul was being quenched and nourished. I never felt that way before. And now I feel like I have these deep roots here. Misti, this is brilliant! You sure you can’t find some Florida magazine to submit it to? So worth publishing!